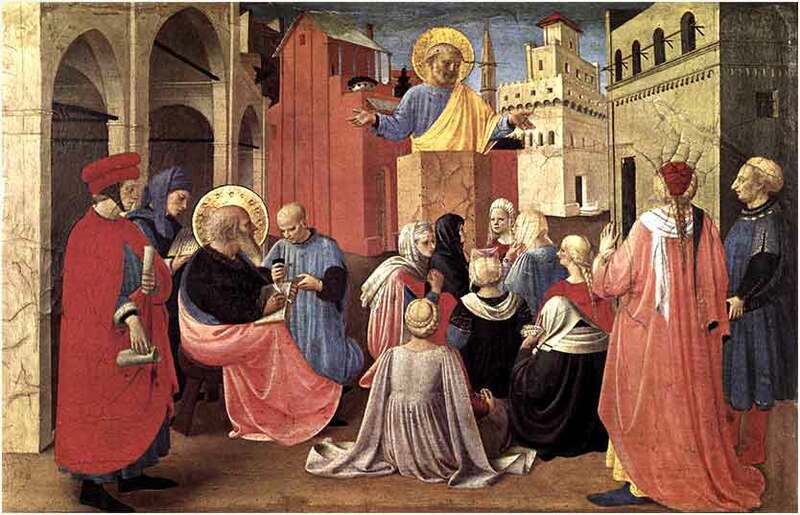 Saint Peter Teaching in the Presence of Saint Mark, Fra Angelico, c. 1432. 177 people in our community are currently praying with you. The Golden Gate Quartet refused to adopt a pop style, instead retaining a strong and authentic "slave" gospel sound, with only a soft bass and drums for background. Their version of Hush is something special. Now, oh Lord, I pray that you may lift up the light of your countenance upon me, and give me peace; in my going out and in my coming in; in my sitting down and my rising up; in my work and in my play; in my joy and in my sorrow, in my laughter and in my tears; until that day comes which is without dawn and without dark. Now the word of the Lord came to Jonah the son of Amittai, saying, "Arise, go to Nineveh, that great city, and call out against it, for their evil has come up before me." But Jonah rose to flee to Tarshish from the presence of the Lord. He went down to Joppa and found a ship going to Tarshish. So he paid the fare and went down into it, to go with them to Tarshish, away from the presence of the Lord. But the Lord hurled a great wind upon the sea, and there was a mighty tempest on the sea, so that the ship threatened to break up. Then the mariners were afraid, and each cried out to his god. And they hurled the cargo that was in the ship into the sea to lighten it for them. But Jonah had gone down into the inner part of the ship and had lain down and was fast asleep. So the captain came and said to him, "What do you mean, you sleeper? Arise, call out to your god! Perhaps the god will give a thought to us, that we may not perish." As noted yesterday, Jonah was a historical figure, a prophet who railed against the idolatry of Jeroboam. Judea had split into two kingdoms after Solomon died; Jeroboam rebelled against Rehoboam, and became the king of the northern half, called Israel. This is a little confusing today, because what we call Israel is what the Bible calls Judea; the Kingdom of Israel was the northern section of today's Israel, and the more important southern half, where Jerusalem lies, was called Judah. Jeroboam was a wicked king; his most notable evil was idolatry, as he set up two golden calves at the borders of his kingdom (1 Kings 12:28). Hence, Jonah's diatribes against him. Nineveh, the capital of heathen Assyria, would eventually conquer the northern Kingdom of Israel and enslave the Hebrews there for many years. Here, God seeks to have Jonah travel into the lion's den of Nineveh itself, to try to bring the people there to righteousness. We are not told why Jonah is so dead set against it, for he was a prophet and a godly man. Perhaps he fears his death. Whatever the reason, he flees his assignment and tries to sail as far as possible away from Israel. But running away, when God has called, never seems to work out well for Old Testament figures, from Adam on. God sends a great storm to threaten Jonah's ship. As the furious storm tosses the craft towards its doom, Jonah — well, Jonah takes a nap. This symbolizes his greater sin, his choice to withdraw from the storm of wickedness and idolatry raining down on Israel and Assyria. He wants to sleep while Israel itself founders. But the agitated captain, on the verge of losing his ship and his life, will have none of it. He rouses Jonah roughly and demands that he pray to the Lord, that He might look on them with favor and save them. 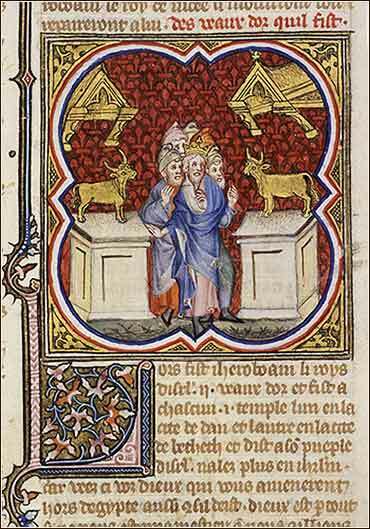 A page from the Bible Historiale (1372) showing Jeroboam setting up the two golden calves.